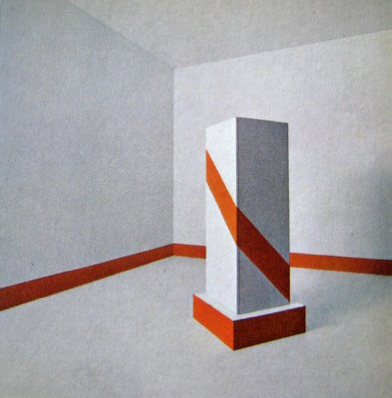 Earlier in the year I made a post about the Austrian/Italian designer Ettore Sottsass, and his influence on my own work. Part of the post dealt with the Superboxes, marvelous and provocative “product-sculptures” he produced in the mid-60’s. They were a reaction to what he had seen and experienced earlier in India and the United States, a contrasting relationship with objects that was deep, spiritual and monogamous, on one hand, in the case of India, and fetishistic and consumerist in the case of the States. The Superboxes bear influences from both continents. Large, and bulky, they are positioned in the middle of the rooms and dominant everything in it, something Sottsass learnt from his study of Indian objects. On the other hand, they are directly influenced from the American pop artists; their stripes and and bright colors reminiscent of Donald Judd or Jasper Johns. impressive and totemic, they operate on a kind of metaphysical wavelength, that seeks to disrupt perceptions of everyday life with a transcendental vibration. They way we read them is not the same as conventional furniture, and in fact, drawer knobs are only occasionally visible, and the objects are not photographed with doors or drawers open. Yet they are obviously products – and sometimes they are photographed in domestic settings with pillows, hi-fi equipment and, bizarrely, melons. On closer inspection we can see the melons and pillows are made out of foam, and these Superboxes are maquettes. Nevertheless, their depiction as products is central to their message; a provocative statement on understanding objects for their spiritual qualities as opposed to only functional or aesthetic concerns. In December this year, Lisette Smits will curate a special Superbox exhibition at the Marres Art Centre in Maastrcht, Original and re-produced Superboxes will be exhibited, with a satellite exhibition featuring contributions from four other artists and designers, including myself. My contribution is still being developed, but in the meantime I am experimenting. The photographs that open and close this post are of a box I made recently, and which I patterned in a monstrous collage of object hyperlinking tags. In the 1960’s, Sottsass set himself the task of criticising the consumption of industrial objects, an issue which he saw, as an industrial designer, very clearly. It cannot be denied that we still consume products easily, like we consume food and air, but we now also consume information. A blanket of virtual information overlays our experience of reality. Augmented reality, the connection of real world objects to hyper-real constructs made of digital information, once conjectured, has become real. In Japan, supermarket products carrying mobile phone readable ‘QR-code‘ link to virtual information, as do movie and concert posters. Its beginning to happen in Europe too…. The proposal is enrichment – a way to manage the array of products in our lives with contextual information, but are we, in essence, only increasing the volume of information to process? 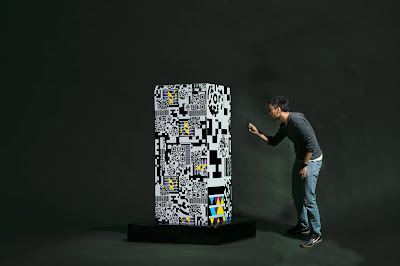 In these images, the model uses a mobile phone to reads a code embedded in the patterns on a furniture box. 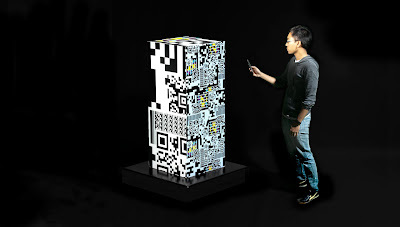 The patterns are made from a collage of QR, Datamatrix, Blotcode and others. The codes link to this post. Posted on Thursday, October 22nd, 2009 at 6:22 am in Uncategorized | | Both comments and pings are currently closed.